This blog introduces PBB-EVPN over an MPLS network. But rather than just describe the technology from scratch, I have tried to structure the explanation assuming the reader is familiar with plain old MPLS L3VPN and is new to PBB and/or EVPN. This was certainly the case with me when I first studied this topic and I’m hoping others in a similar position will find this approach insightful. I won’t be exploring a specific quirk or scenario – rather I will look at EVPN followed by PBB, giving analogies and comparisons to MPLS L3VPN as I go, before combining them into PBB-EVPN. I will focus on how traffic is identified, learned and forwarded in each section. So what is PBB-EVPN? Well, besides being hard to say 3 times fast, it is essentially an L2VPN technology. It enables a Layer 2 bridge domain to be stretched across a Service Provider core while utilizing MAC aggregation to deal with scaling issues. Let’s look at EVPN first. MPLS L3VPN assigns PE interfaces to VRFs. It then uses MP-BGP (with the vpnv4 unicast address family) to advertise customer IP Subnets as VPNv4 routes to Route Reflectors or other PEs. Remote PEs that have a VRF configured to import the correct route targets, accept the MP-BGP update and install an ipv4 route into the routing table for that VRF. EVPN uses PE interfaces linked to bridge-domains with an EVI. It then uses MP-BGP (with the l2vpn evpn address family) to advertise customer MAC addresses as EVPN routes to Route Reflectors or other PEs. Remote PEs that have an EVI configured to import the correct route target, accept the MP-BGP update and install a MAC address into the bridge domain for that EVI. This analogy is a little crude, but in both cases packets or frames destined for a given subnet or MAC will be imposed with two labels – an inner VPN label and an outer Transport label. The Transport label is typical communicated via something like LDP and will correspond to the next hop loopback of the egress PE. 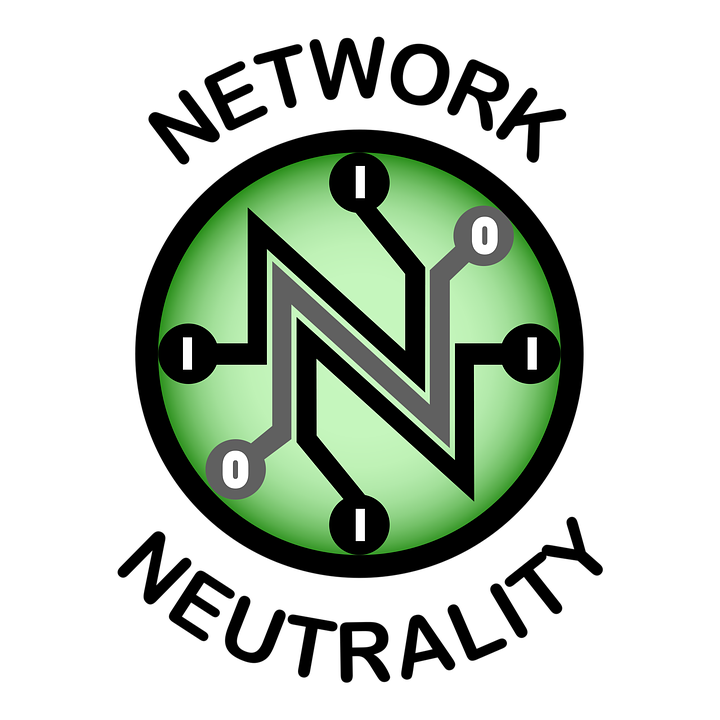 The VPN label is communicated in the MP-BGP updates. In EVPN, customer devices tend to be switches rather than routers. PE-CE routing protocols, like eBGP, aren’t used since it operates over layer 2. The Service Provider appears as one big switch. In this sense, it accomplishes the same as VPLS but (among other differences) uses BGP to distribute MAC address information, rather than using a full mesh of pseudowires. 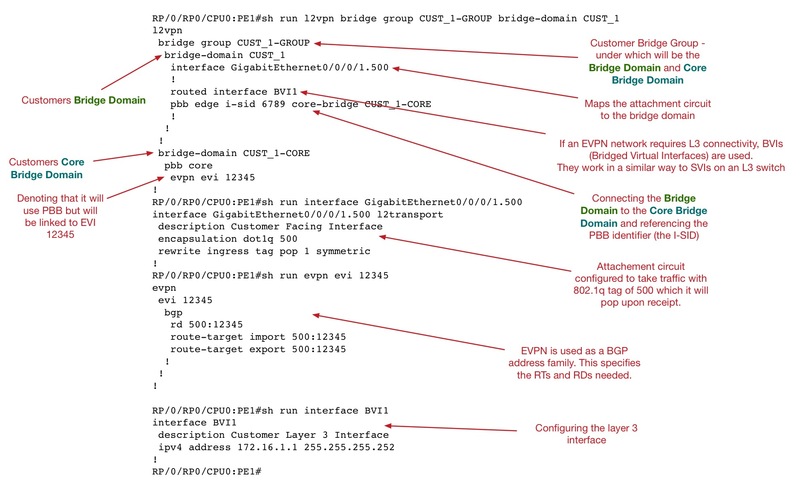 EVPN uses an EVI, or Ethernet Virtual Identifier, to identify a specific instance of EVPN as it maps to a bridge domain. For the purposes of this overview, you can think of an EVI as being quasi-equivalent to a VRF. A customer facing interface will be put into a bridge domain (layer 2 broadcast domain), which will have an EVI identifier associated with it. The MAC address learning that EVPN utilizes what is called control-plane learning, since it is BGP (a control-plane routing protocol) that distributes the MAC address information. This is in contrast to data-plane learning, which is how a standard switch learns MAC addresses – by associating the source MAC address of a frame to the receiving interface. NB. For MPLS L3VPN config the RD config (which is usually configured under CE-PE eBGP config) is not shown. PBB config is shown in the EVPN Bridge domain, this will be explained further into the blog. Any given customer site can have hundreds or even thousands of MAC addresses, as opposed to just one subnet (as in an MPLS L3VPN environment). The number of updates and withdrawals that BGP would have to send could be overwhelming if it needed to make adjustments for MAC addresses appearing and disappearing – not to mention the memory requirements. And you can’t summarise MAC addresses like you can IP ranges. It would be like an MPLS L3VPN environment advertising /32 prefixes for every host rather than just one prefix for the subnet. We need a way to summarise or aggregate the MAC addresses. PBB can help solve the EVPN scaling issue by performing one key function – it maps each customer MAC address to the MAC address of the attaching PE. Customer MAC addresses are called C-MACs. The PE MAC addresses are call B-MACs (or Bridge MACs). NB. 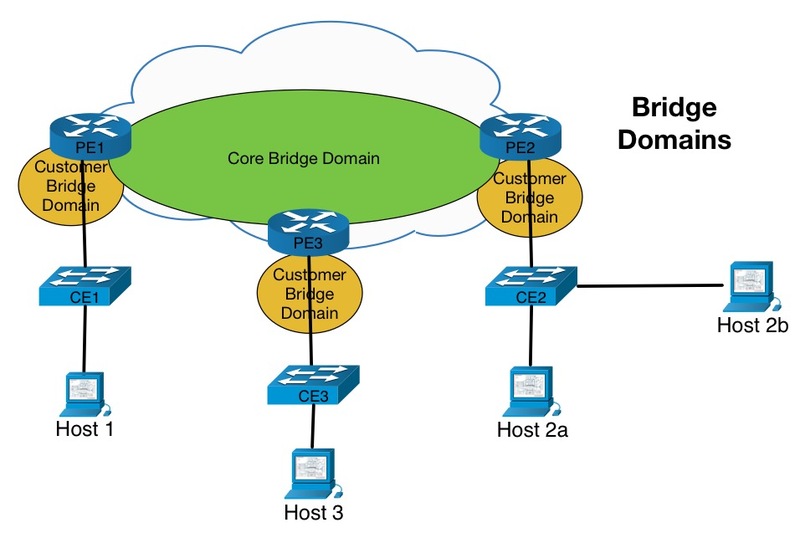 In PBB terminology the provider devices are called Bridges. So a BEB (Backbone Edge Bridge) is a PE and a BCB (Backbone Core Bridge) is a P. For sake of simplicity, I will continue to use PE/P terminology. Also worth noting is that PBB diagrams often show service provider devices as switches, to illustrate the layer 2 nature of the technology – which I’ve done above. In the above diagram the SID (or Service ID) represents a layer 2 broadcast domain similar to what an EVI represents in EVPN. Frames arriving on a PE interface will be inspected and, based on certain characteristics, it will be mapped or assigned to a particular Service ID (SID). To draw an analogy to MPLS L3VPN – the VRF that an incoming packet is assigned to is determined by whatever VRF is configured on the receiving interface (using ip vrf forwarding CUST_1 in Cisco IOS interface CLI). Once the SID has been allocated, the entire frame is then encapsulated in the outer layer 2 header with destination MAC of the egress PE. In this way C-MACs are mapped to either B-MACs or local attachment circuits. Most importantly however the core P routers do not need to learn all of the MAC addresses of the customers. They only deal with the MAC addresses of the PEs. 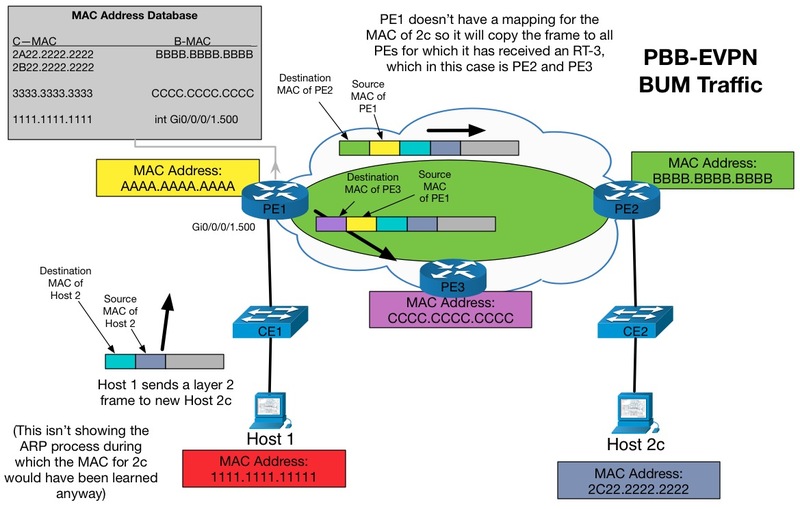 This allows a PE to aggregate all of the attached C-MACs for a given customer behind its own B-MAC. But how does a remote PE learn which C-MAC maps to which B-MAC? In PBB learning is done in the data-plane, much like a regular layer 2 switch. When a PE receives a frame from the PBB core, it will strip off the outer layer 2 header and make a note of the source B-MAC (the ingress PE). It will map this source B-MAC to the source C-MAC found on the inner layer 2 header. When a frame arrives on a local attachment circuit, the PE will map the source C-MAC to the attachment circuit in the usual way. PBB must deal with BUM traffic too. BUM traffic is Broadcast, Unknown Unicast or Multicast traffic. An example of BUM traffic is the arrival or frame for which the destination MAC address is unknown. 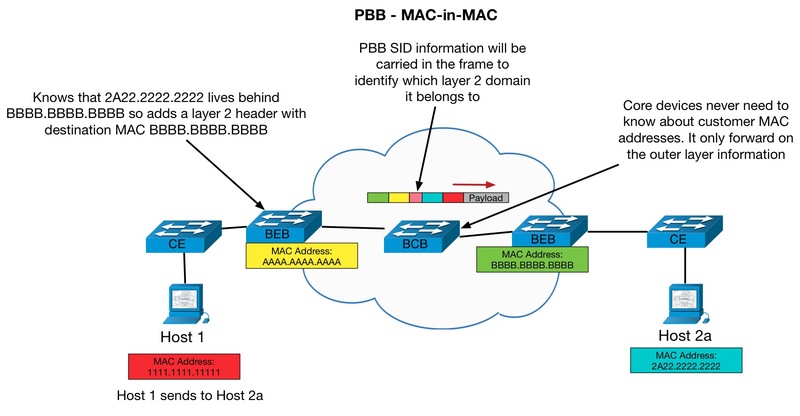 Rather than broadcast like a regular layer 2 switch would, a PPB PE will set the destination MAC address of the outer layer 2 header to a special multicast MAC address that is built based on the SID and includes all the egress PEs that are part of the same bridge domain. EVPN uses a different method or handling BUM traffic but I will go into that later in the blog. Overall, PBB is more complicated than the explanation given here, but this is the general principle (if you’re interested, see section 3 of my VPLS, PBB, EVPN and VxLAN Diagrams document that details how PBB can be combined the 802.1ad to add an aggregation layer to a provider network). 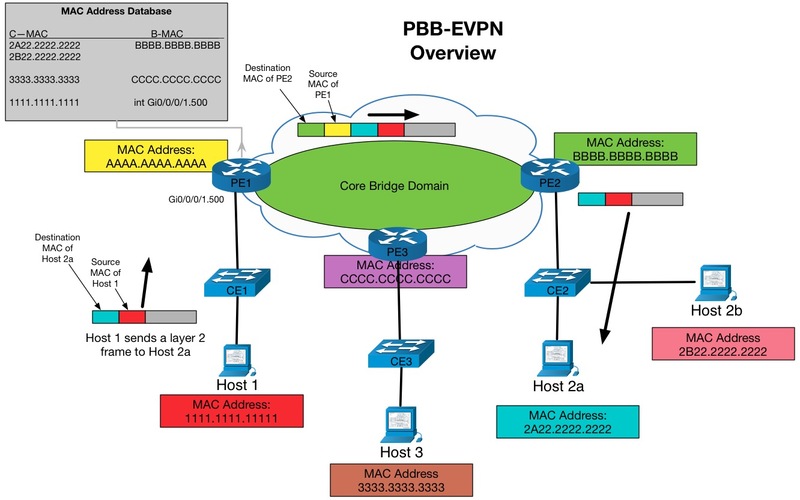 With the help of PBB, EVPN can be adapted so that it deals with only the B-MACs. To accomplish this, each EVPN EVI is linked to two bridge domains. One bridge domain is dedicated to customer MAC addresses and connected to the local attachment circuits. The other is dedicated to the PE routers B-MAC addresses. Both of these bridge domains are combined under the same bridge group. The PE devices will uses data-plane learning to build a MAC database, mapping each C-MAC to either an attachment circuit or the B-MAC of an egress PE. Source C-MAC addresses are learned and associated as traffic flows through the network just like PBB does. The only thing EVPN needs to concern itself with is advertising the B-MACs of the PE devices. EVPN uses control-plane learning and includes the B-MACs in the MP-BGP l2vpn evpn updates. For example, if you were to look at MAC address known to a particular EVI on a route-reflector, you would only see MAC address for PE routers. NB. I have added the concept of a BVI, or Bridged Virtual Interface, to the above output. This can be used to provide a layer 3 breakout or gateway similar to how an SVI works on a L3 switch. Now lets look at how PBB-EVPN handles BUM traffic. Unlike PBB on its own, which just sends to a multicast MAC address, PBB-EVPN will use unicast replication and send copies of the frame to all of the remote PEs that are in the same EVI. This is an EVPN method and the PE knows which remote PEs belong to the same EVI by looking in what is called a flood list. 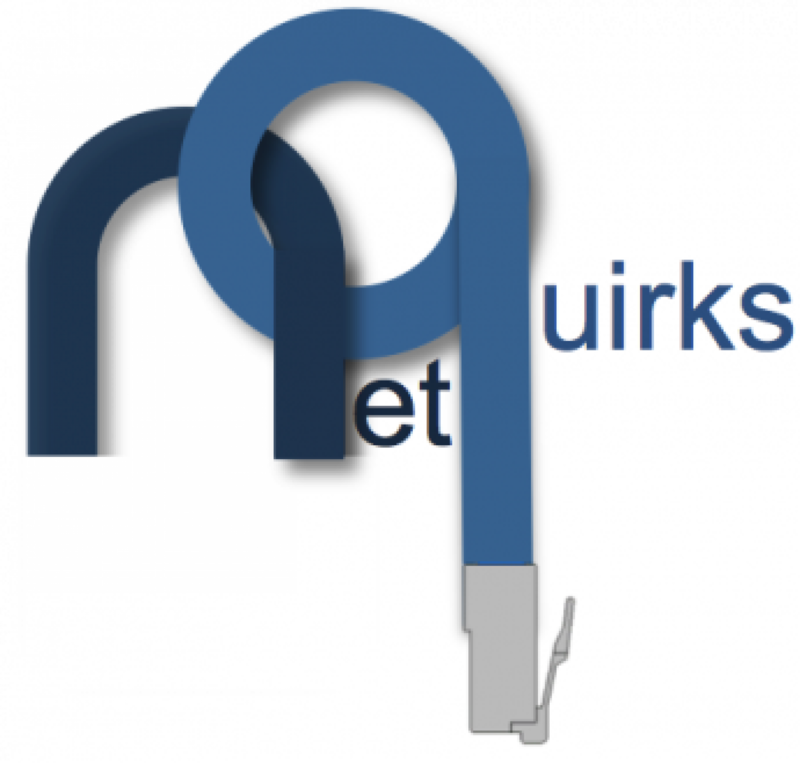 MPLS L3VPN sends VPNv4 routes in its updates. But EVPN send more than one “type” of update. The type of update, or route-type as it is called, will denote what kind of information is carried in the update. The route-type is part of the EVPN NLRI. For the purposes of this blog we will only look at two route-types. Route-Type 3s, which carry information on the egress PEs that belong to an EVI. It is these Route-Type 3s (or RT-3s for short) that are used to build the flood list. When BUM traffic is received by a PE, it will send copies of the frame to all of its attachment circuits (except the one it received the frame on) and all of the PEs for which it has received a Route-Type 3 update. In other words, it will send to everything in its flood-list. So that’s it, in a nutshell. In this way PBB and EVPN can work together to create an L2VPN network across a Service Provider. There are other aspects of both PBB and EVPN, such as EVPN multi-homing using Ethernet Segment Identifiers or PBB MAC clearing with MIRP to name just a couple, but the purpose of this blog was to provide an introductory overview – specifically for those used to dealing with MPLS L3VPN. Thoughts are welcome, and as always, thank you for reading.